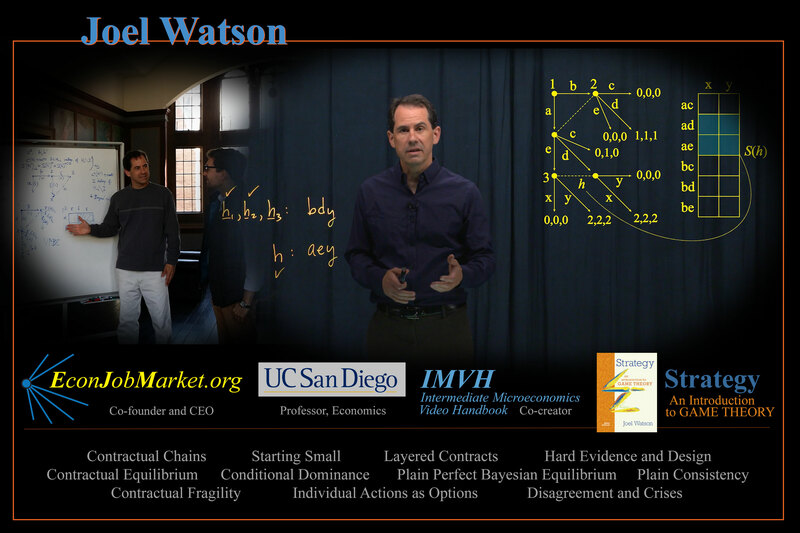 Joel Watson is a Professor in the Economics Department at the University of California, San Diego. His research examines how contractual relationships are formed and managed, as well as the role of institutions in facilitating contracts and enforcement, using game-theoretic models. Watson’s work addresses topics in a variety of applied areas, including law and economics, macroeconomics, labor economics, international economics, and environmental economics. He has authored numerous technical papers and a popular textbook on game theory (Strategy: An Introduction to Game Theory). Watson obtained his B.A. from UCSD and his Ph.D. from Stanford’s Graduate School of Business. He spent two years at Oxford’s Nuffield College before returning to UCSD as a faculty member. Watson has also had several visiting appointments at Yale University over the years and was Fellow at the Center for Advanced Study in the Behavioral Sciences at Stanford in 2012-2013. He is a Fellow of the Econometric Society. Watson has extensive experience and a record of leadership in administration, instruction, and professional service. As Chairperson of the Economics Department at the University of California, San Diego from 2006 until 2008, he managed about 70 faculty, staff, and lecturers, and he oversaw some of UCSD’s most popular undergraduate major programs. Watson has served as the chair of UCSD’s Campus and Community Planning Committee, which oversees all campus physical planning including project site selection and design. Watson has been instrumental in furthering interdisciplinary research and instructions, in particular in the collaboration between UCSD’s Economics Department and the Scripps Institution of Oceanography. He was a Co-PI on Scripps’ NSF IGERT grant “Global Change, Marine Ecosystems, and Society” and has been part of the leadership team at the Center for Marine Biodiversity and Conservation. Watson is also a pedagogical innovator, in particular with respect to video presentations and hybrid class formats. 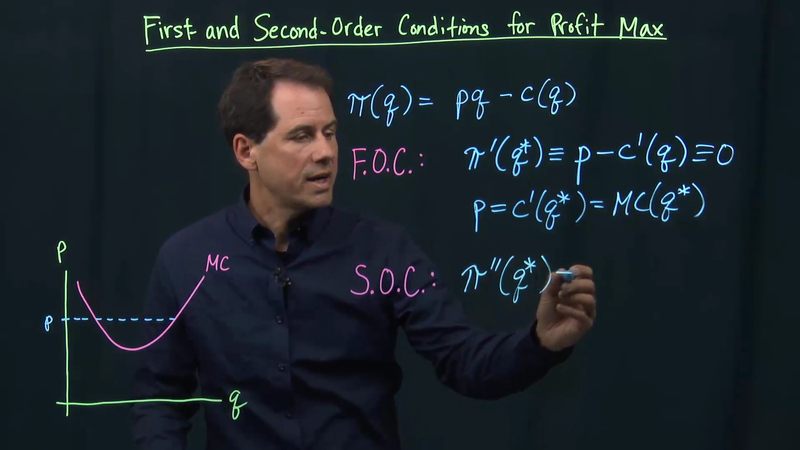 He devised, managed the development of, and contributed many lectures to the Intermediate Microeconomics Video Handbook. Watson was given the Economics Department’s Award for Excellence in Undergraduate Instruction in 2010. On the professional side, Watson co-founded and serves as the CEO of Econ Job Market®, a non-profit charitable (501c3) corporation that provides a central electronic repository for advertisements and application materials (including application forms, candidate-provided documents, and letters of recommendation) in the economics Ph.D. job market. He also has served in an editorial capacity for four technical journals. Professor, University of California, San Diego, 2002-present. Visiting Professor, Humanities and Social Science, California Institute of Technology, Fall 2014. Fellow, Center for Advanced Study in the Behavioral Sciences at Stanford University, class of 2012-2013. Visiting Scholar, Economics, University of Southern California, Fall 2011. Visiting Professor, Cowles Foundation, Yale University, Fall 2010. Visiting Professor, Cowles Foundation, Yale University, Fall 2009. Chairperson, Department of Economics, University of California, San Diego, 2006-2008. Visiting Fellow, Corporate Law Center, Yale Law School, 2006. Associate Professor, University of California, San Diego, 1998-2002. Visiting Professor, Kellogg Graduate School of Management, Northwestern University, 2000. Visiting Professor, Cowles Foundation, Yale University, 1998-1999. Assistant Professor, Economics, University of California, San Diego, 1994-1998. Prize Research Fellow, Nuffield College, Oxford University, 1992-1994. Junior Dean, Nuffield College, 1993. Visiting Lecturer, University of California, San Diego, Summer 1993. Consultant/Intern, The RAND Corporation, 1991-1992. Clerk, Wright and L'Estrange (a San Diego corporate law firm), 1985-1989. Ph.D., Economics, Graduate School of Business Stanford University, June 1992. B.A., Economics, University of California, San Diego, March 1988. M.A. Oxford University (Honorary), November 1992. PI, UCSD Frontiers of Innovation Scholars Program (to support graduate student Isla Globus-Harris), 2015-2016. Co-PI, University of California Office of the President, Innovative Learning Technology Initiative grant 20140207, "Intermediate Microeconomics Video Handbook," 2014-2016. PI, National Science Foundation award SES-1227527, "Contractual Chains and Related Work," 2012-2014. Co-PI, National Science Foundation IGERT grant, "Global Change, Marine Ecosystems, and Society," 2009-2014. PI, Southern California Innovation Project grant, "Contract Interpretation by External Enforcers," with Alan Schwartz, 2009-2010. PI, Southern California Innovation Project grant, "Client-Based Entrepreneurship," with Jim Rauch, 2009-2010. Various contracts/grants from the National Oceanic and Atmospheric Administration (Southwest Fisheries Science Center), 2008-2012. Co-PI, Japanese Banker's Association grant (with Makoto Shimoji), 2004. PI, National Science Foundation grant SES-0095207, "Layered Contract, Enforcement Institutions, and Intermediaries," 2001-2002. Co-PI, National Science Foundation grant SBR-9975277, "Contracts, Relationships, and Real Activities," with Garey Ramey and Wouter den Haan,1999-2000. PI, National Science Foundation grant SBR-9630270, "Markets and Institutions: A Matching Approach," with Garey Ramey, 1996-1998. PI, National Science Foundation grant SBR-9422196, "The Dynamics of Relationships with Incomplete Information," 1995-1996. Co-Founder and Chief Executive Officer, EconJobMarket.org, a non-profit/tax-exempt charitable organization that provides a central repository for advertisements, applications, and letters of recommendation for the economics Ph.D. job market. Fellow of the Econometric Society, elected 2011. Referee: American Economic Review, American Journal of Political Science, Econometrica, Economic Design, Economic Journal, European Economic Review, European Journal of Political Economy, Games and Economic Behavior, International Economic Review, International Journal of Game Theory, International Journal of Industrial Organization, Italian Ministry for Education University and Research, Journal of Economic Behavior and Organization, Journal of Economic Theory, Journal of Economics and Management Strategy, Journal of International Economics, Journal of Labor Economics, Journal of Law, Economics, and Organization, Journal of Political Economy, Mathematical Social Sciences, Rand Journal of Economics, Review of Economic Dynamics, Review of Economic Studies, Social Choice and Welfare, the National Science Foundation, and various book publishers. Co-editor, Journal of Law, Economics, and Organization, 2012-present. Advisory Editor, Games and Economic Behavior, 2005-present. Co-editor, The B.E. Journals in Theoretical Economics, 2004-2007. Editorial Board Member, The International Journal of Game Theory, 2003-2006. Editorial Board Member, The B.E. Journals in Theoretical Economics, 2000-2004. Program Organizer (Economics), First World Congress of the Game Theory Society. Past/Present Member, Econometric Society, Game Theory Society, American Law and Economics Association and American Economic Association. "Contractual Chains" (2018, after five years of drafting). "Relational Contracting, Negotiation, and External Enforcement" (2018, includes supplemental appendix), with David Miller and Trond Olsen. "A General, Practicable Definition of Perfect Bayesian Equilibrium" (2017 revision). Click here for related video lectures for graduate students and researchers. "The Optimal Structure of Conservation Agreements and Monitoring" (2017 revision), with Heidi Gjertsen, Theodore Groves, David A. Miller, Eduard Niesten, and Dale Squires. "Hold-Up and Durable Trading Opportunities" (2010, under revision), with Chris Wignall. "Contract and Mechanism Design in Settings with Multi-Period Trade" (2005, under revision, older version posted here). "Conditioning Institutions and Renegotiation" (1998r1999, under revision), with Garey Ramey. Strategy: An Introduction to Game Theory, THIRD EDITION (now available), New York: W. W. Norton and Company, 2013. (This edition contains substantial new material and solutions to selected exercises.) Second Edition published 2007. First Edition Published 2002. Instructor's Manual for Strategy, available from W. W. Norton and Company, 2002, 2008, 2013. ''Statistical Evidence and the Problem of Robust Litigation," with Jesse Bull, The RAND Journal of Economics, accepted and in press, 2019. "A Contract-Theoretic Model of Conservation Agreements," with Heidi Gjertsen, Theodore Groves, David A. Miller, Eduard Niesten, and Dale Squires, in Econometric Methods and Their Applications in Finance, Macro and Related Fields (K. Hadri and W. Mikhail, eds. ), World Scientific Publishing: Singapore, 2014. "Contract and Game Theory: Basic Concepts for Settings with Finite Horizons," Games 4 (2013): 457-496. "The Renegotiation-Proofness Principle and Costly Renegotiation," with James Brennan, Games 4 (2013): 347-366. "Conceptualizing Contractual Interpretation," with Alan Schwartz, Journal of Legal Studies 42 (2013, Issue 1): 1-34. "Contract, Renegotiation, and Hold Up: Results on the Technology of Trade and Investment," with Kristy Buzard, Theoretical Economics 7 (2012): 283-322. "John Forbes Nash, Jr.," in The New Palgrave Dictionary of Economics (2nd), L. Bloom and S. Durlauf (eds. ), Palgrave Macmillan, 2007. "Evidence Disclosure and Verifiability," with Jesse Bull, Journal of Economic Theory 118 (Issue 1, September 2004): 1-31. "Network Intermediaries in International Trade," with James Rauch, Journal of Economics and Management Strategy 13 (2004): 69-93. "The Law and Economics of Costly Contracting," with Alan Schwartz, Journal of Law, Economics, and Organization 20 (April 2004): 2-31. "Liquidity Flows and Fragility of Business Enterprises," with Wouter den Haan and Garey Ramey, Journal of Monetary Economics 50 (2003): 1215-1241. "Starting Small in an Unfamiliar Environment," with Jim Rauch, International Journal of Industrial Organization 21 (2003): 1021-1042. "Contractual Intermediaries," with Garey Ramey, Journal of Law, Economics, and Organization 18 (2002): 362-384. "Starting Small and Commitment," Games and Economic Behavior 38 (2002): 176-199. "Bilateral Trade and Opportunism in a Matching Market," with Garey Ramey, Contributions to Theoretical Economics, Vol. 1, No. 1 (2001), Article 3. "Job Destruction and the Experiences of Displaced Workers," with Wouter den Haan and Garey Ramey, Carnegie-Rochester Conference Series on Public Policy 52 (2000): 87-128. "Starting Small and Renegotiation," Journal of Economic Theory 85 (1999): 52-90. "Conditional Dominance, Rationalizability, and Game Forms," with Makoto Shimoji, Journal of Economic Theory 83 (1998): 161-195. "Alternating-Offer Bargaining with Two-Sided Incomplete Information," Review of Economic Studies 65 (1998): 573-594. "Multiple-Issue Bargaining and Axiomatic Solutions," with Clara Ponsati, International Journal of Game Theory 26 (1997): 501-524. "Contractual Fragility, Job Destruction, and Business Cycles," with Garey Ramey, Quarterly Journal of Economics 112 (1997): 873-911. "On `Reputation' Refinements with Heterogeneous Beliefs," with Pierpaolo Battigalli, Econometrica 65 (1997): 369-374. "Learning about a Population of Agents and the Evolution of Trust and Cooperation," with Anthony Bower and Steve Garber, International Journal of Industrial Organization 15 (1997): 165-190. "Reputation in Repeated Games with no Discounting," Games and Economic Behavior 15 (1996): 82-109. "Information Transmission when the Informed Party is Confused," Games and Economic Behavior 12 (1996): 143-161. "Cooperation in the Infinitely Repeated Prisoners' Dilemma with Perturbations," Games and Economic Behavior 7 (1994): 260-285. "A 'Reputation' Refinement without Equilibrium," Econometrica 61 (1993): 199-205. "Communication and Superior Cooperation in Two-Player Normal Form Games," Economics Letters 35 (1991): 267-271. The third edition of this successful text is even more student-friendly than before. A number of sections have been added, and numerous chapters substantially revised. The book contains dozens of new exercises along with solutions to selected exercises. Chapters are short and focused, with just the right amount of mathematical content and end-of-chapter exercises. New passages walk students through tricky topics. For more information, visit the W.W. Norton and Company website by clicking here or call (800) 233-4830. To contact your local W.W. Norton representative, call (800) 353-9909 or click here. 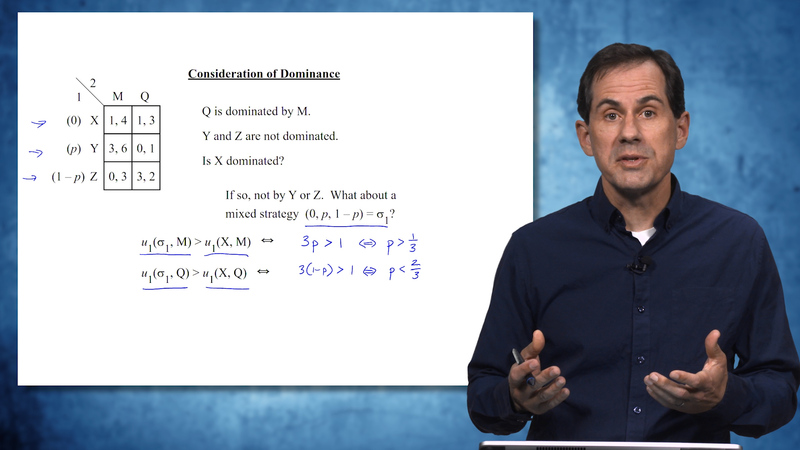 Working with Melissa Famulari and other UCSD colleagues, Watson developed the innovative video-handbook concept and created a comprehensive set of video lectures for intermediate microeconomics, the Intermediate Microeconomics Video Handbook. The IMVH, which features an intuitive web interface and ancillary materials, is utilized for microeconomics and elective courses across the University of California and is also available for use at other universities. For more information, follow this link to the IMVH page at the UCSD Economics Department. All videos are copyrighted by Joel Watson as of 2017 and earlier. EJM improves the flow of information in the job market for academic economists by providing a central repository for application materials and recommendation letters (at EconJobMarket.org and my.econjobmarket.org) and encouraging interoperability between the various recruitment systems that recruiters use. Watson is EJM's CEO and manages operations with officers John Rust, Martin Osborne, and Michael Peters. Dr. Watson is available for business and legal consulting in the following areas of expertise: Strategic Management, Contract Design and Implementation, Market Design and Pricing, and Instructional Methods and Media. To contact Dr. Watson, send an email to joel [at] joelwatson.org. © 2016, Dr. Joel Watson. All rights reserved.